Eero Saarinen (1910-1961), the Finnish architect who conceived the St. Louis Gateway Arch, along with many other well-known structures, also received accolades for his modernist furniture designs made by Knoll. With popularity comes imitation. Before you spend a hefty chunk of your paycheck on a Saarinen Table, be sure you're getting your money's worth with these tips. One of Saarinen's first notable furniture achievements was in partnership with Charles Eames after the two met while attending the Cranbrook Academy of Art in Bloomfield Hills, Michigan. Their collaborative design, known as the Organic Chair, a small and comfy reading chair, won first place in the Organic Design Home Furnishings competition hosted by the Museum of Modern Art in 1940. Saarinen didn't start working with Hans and Florence Knoll, whom he also met at Cranbrook, until the late 1940s. Together they created forward-thinking furniture designs until he passed on at the young age of 51. One of those pieces was the popular Saarinen Table, often referenced as the Tulip Table, dating to the late 1950s. These popular tables have been made in both round and oval versions, and they have always been solidly built. Due to this table style's versatility and demand, it has been widely copied. Savvy shoppers learn to look for clues to indicate the table they're purchasing is an authentic piece. Saarinen's Pedestal Collection dates back to 1957. The seating in the grouping consists of molded fiberglass chairs and upholstered stools, both with aluminum pedestal bases. These popular designs are known as Tulip Chairs. Versions exist with arms and without, and they can be stationary or swivel. To determine whether a Saarinen Table you're considering is authentic, take a look at the materials. The bases of Saarinen Tables, like the coordinating Tulip Chairs, are made of cast aluminum, finished in black, white or platinum. A genuine Saarinen table would never have a base made of plastic, wood, or any other material. They are also made of one piece of aluminum, so there will not be multiple seams present. Tabletops were made in an array of colors constructed of laminate or wood veneers, or natural materials like granite or coated Arabescatomarble (in comparison to less expensive Carrera marble). Knoll never used plastic for these tops, however, so that can be a knockout giveaway. Edges should be tapered as well. A table with flat edges is not likely to be authentic. If you're considering a table with a white coated marble top with gray veining, take a closer look. Some copies try to get the Saarinen look using marble, but the quality will be lesser in the lookalikes. In fact, the quality of these tables should be high all the way around. If you're looking at a flimsy, cheaply made table, it's not an original Saarinen. From Knoll.com: "With the Pedestal Collection, Eero Saarinen vowed to eliminate the 'slum of legs' found under chairs and tables with four legs. He worked first with hundreds of drawings, which were followed by 1/4 scale models. Since the compelling idea was to design chairs that looked good in a room, the model furniture was set up in a scaled model room the size of a doll house." With all this attention to detail, you might imagine that an authentic Saarinen Table would be labeled as such. This is true in most cases, although you will find older tables devoid of a label on occasion. Nevertheless, take a look under the top to see if you can locate an attached plaque with Saarinen's signature or the Knoll name. If the quality of the table seems to be high, and you don't find a label on a vintage table, do a bit more investigating while you're down there. Inspect the area in the table where the pedestal base meets the table top. The top of a genuine Saarinen table screws down onto a single-threaded rod on the top of the base. When the tabletop is in place, you should not see any visible screws between the top and the base. Be sure to measure the table. Both round and oval versions should be 28 1/4 inches tall. The diameter of the round style will fit one of five sizes: 35 3/4 inches, 42 1/2 inches, 47 1/4 inches, 54 inches, and 60 inches. 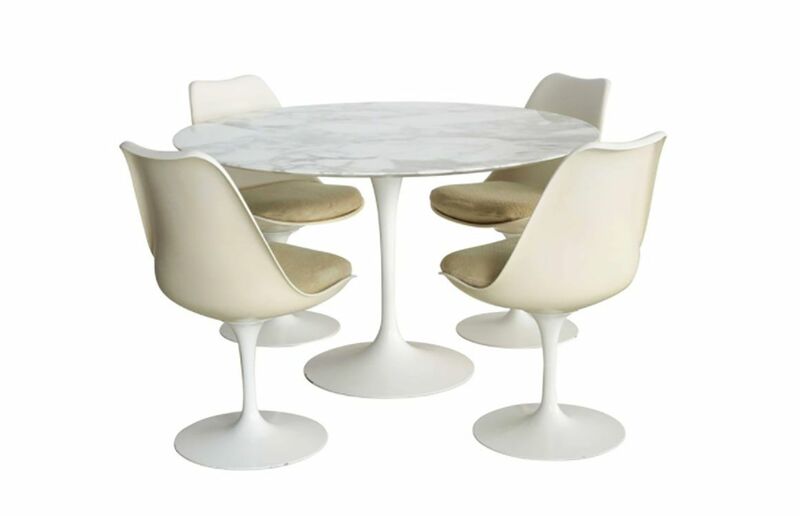 Oval Saarinen tables 78 inches by 47 3/4 inches or 96 inches by 54 inches. Keep in mind that most all Saarinen designs have all been copied, but only authentic pieces made by Knoll Associates will hold their high value in the vintage marketplace.